View from the BonaVista Lounge, 2015. Photo: Travis Diehl. PERCHED PARTWAY DOWN Bunker Hill, as if sliding off toward the braid of freeways in the valley below, the Westin Bonaventure Hotel marks the ragged westernmost edge of downtown LA. Its quintet of one-hundred-plus-meter mirrored cylinders, which look something like an unassembled skyscraper, make it the city’s largest hotel by volume. It is also the most iconic; built in 1976 by John C. Portman Jr., the building still beams the same retro advanced capitalism that led Fredric Jameson to flag the structure, part upscale sleepery, part shopping mall, as an emblem of the postmodern mindset. Indeed. Shoot through the atrium and up the building’s side in the mildly Deco, glass-walled Red Circle elevator to the thirty-fifth floor where, spinning clockwise at the speed of progress, is the recently renovated BonaVista Lounge, one of the last rotating cocktail bars on Earth. 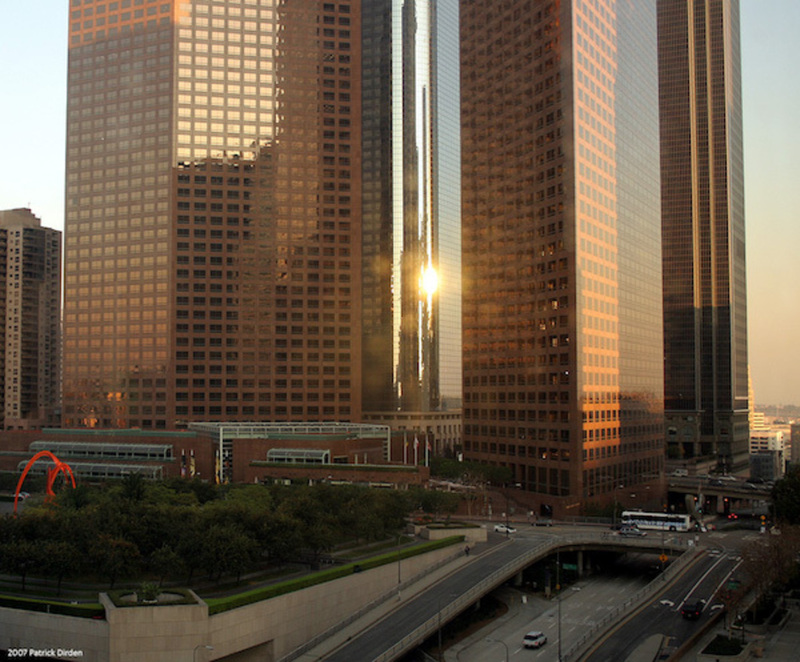 It takes roughly three hours and as many stiff drinks to make one slow sweep across DTLA. And if the city you look down on hardly resembles the space-age glitz urged on by Portman, there’s still no better vista from which to contemplate the latest round of fitful growth in this teeming, uneven metropolis. Arriving in early evening, you’d have to know what to look for to spot the buildings that may be the most dramatic symptom of all this change, the Rosslyn Million Dollar Fireproof Hotel and the Rosslyn Annex, because at this light hour their giant rooftop signs—the building names spelled out in big letters and framed by enormous hearts—aren’t yet lit. Bracketed by the goldish glass of the looming Wells Fargo and Chase headquarters, those wiry outlines are barely visible against the distant palimpsest of grayish HVAC on century-old, beige brick-and-iron offices. Built in 1913 and ’23, respectively, in the Beaux Arts style, the hotels date from the early-twentieth-century boom that gave Los Angeles its historic core. Drained, like much of downtown, by the centrifugal freeways, the Rosslyn made the long slide from hotels to “hostelries” to flophouses. Sometime during the last recession, developers snuck in another boom: A 2009 renovation turned what are still touted on painted signage as “fireproof rooms” into “micro-lofts,” and ushered in downtown’s present half-decade of Disneyfied Manhattanism. The Rosslyn Annex, 2015. Photo: Jim Winstead. “When Art Walk goes right past your door,” says the Rosslyn Lofts ad copy, “you know you’re close to the arts.” Never mind what Art Walk actually is. The official Arts District, dappled with murals like a cleaner, friendlier Bushwick, is another few blocks east on Fourth Street. Even then, you’re only on the fringe of the serious downtown galleries, which, with a couple notable exceptions, have staked out warehouses on the far side of the LA River. Meanwhile, on Main at the Rosslyn, though the gentrification front has shifted one block east, you’re technically on Skid Row. To the Rosslyn’s credit, one hundred units of the Annex’s 264 have been set aside for struggling veterans. This is barely a start. By 6 PM, the head shops and toy stores pull down their steel shutters, and the largest homeless population in the country puts up their tents. These are the all-too-real residents of streets blighted by the Reagan era; long out of sight and mind, they are now seen as squatters on greedily eyed acres. Trekking from Grand Avenue to the Arts District, what’s an urban pioneer to do? Take the long way, probably. Or take an Uber. 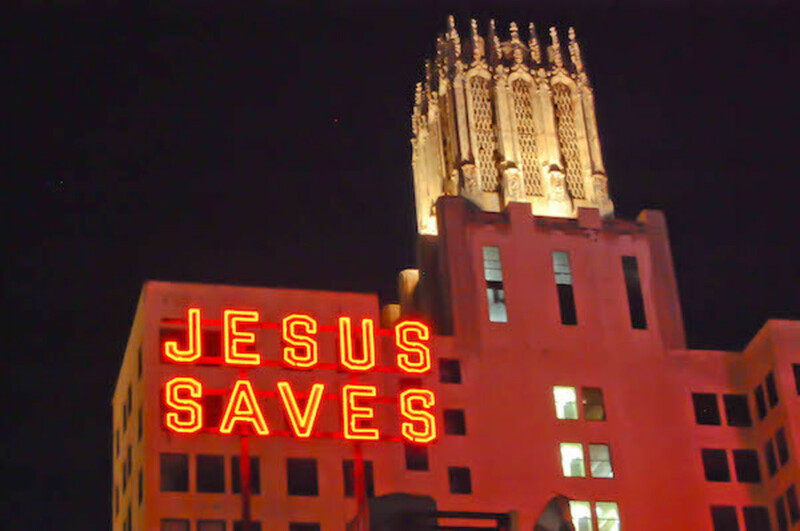 Revolving now toward the southeast: A neon landmark spells “JESUS SAVES” in story-high red letters, a relic of the decade when the United Artists Building and Theater was a working cathedral. In 2014, the building became a flagship of what LA’s boosters call a renaissance, when it was restored by the world’s preeminent chain of art hotels: the Ace. If Rosslyn is someone’s idea of how artists live, the Ace is an aspirational symbol of how itinerant “creatives” see the world. But if this still-seedy stretch of South Broadway has gained (with the Ace’s help) an Acne Jeans and an Aesop, complete with fedora-sporting clientele, the unforgiving spikes of the sidewalk decor and the many muttering beggars show how jarring this renaissance truly is—as if Los Angeles skipped the interim phase, and priced out struggling artists who were never there. The United Artists Building and Theater, 2015. Photo: Telstar Logistics. Meanwhile, the BonaVista Lounge adjusts its aching panorama. Due south is the thin neon streak of the rooftop bar at the Standard—long the district’s preeminent boutique hotel. 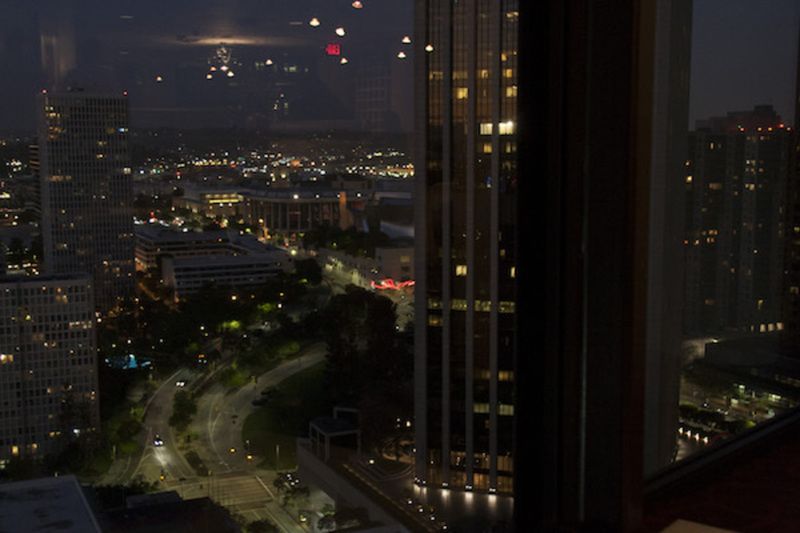 And behind, sitting on the Downtown Sheraton like an unearthly brake drum, is the shell of LA’s one other rotating restaurant, long since stopped. On the right of the frame, slightly west, the obsidian facade of the Merchants Bank HQ reflects a slithering interchange. And wedged between the PWC and Paul Hastings towers, their dark shapes now punctured by office lights, is the newest addition to our skyline: the Wilshire Grand Hotel. Rising from street level in a gradient, from finished to un-: a foundation on the largest continuous concrete pour in history; then a few glassed and illuminated floors; then shadowed scaffolding; then a few stories of exposed elevator core, capped by the uncommon silhouette of a construction crane. The Grand replaces another famous 1952 hotel of the same name, at the same site. When completed, in 2017, it will be the tallest—though not the largest—American building west of the Mississippi—and the first with a spire. Make no mistake: This, more than any warehouse renovated by architects and hung with art by New Yorkers, is the business end of LA’s boom. For a while the B of A blots out the sky. 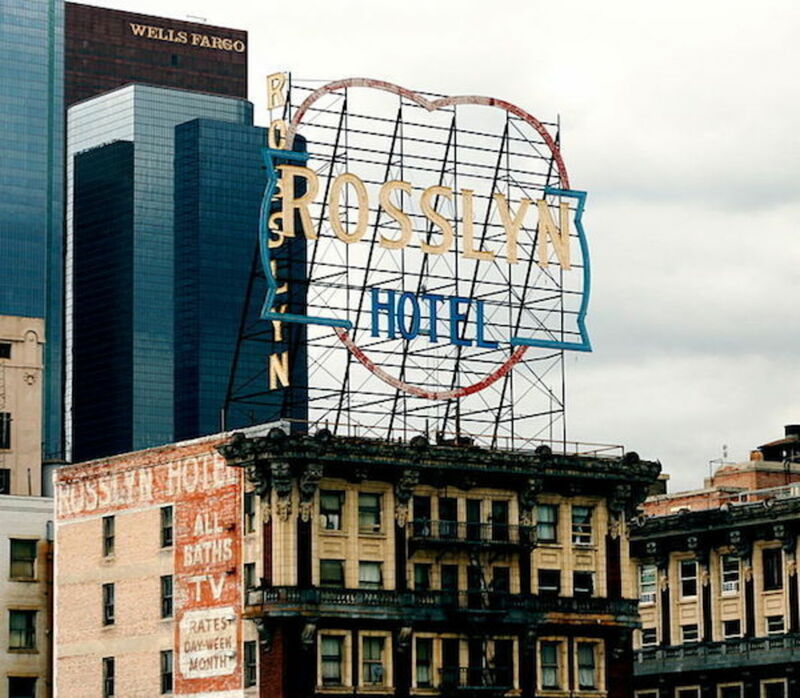 Then there’s the Rosslyn again. With any luck, the hearts are now aglow. It’s rare, though, that they leave the lights on. LA’s boosters have always put on a good show. But that kind of power doesn’t come cheap. Travis Diehl is a writer based in Los Angeles. View of Bunker Hill, 2015. Photo: Patrick Dirden.